The Eyer Homestead property, at 1045 Elgin Mills Road East, includes both a renovated heritage house (the Eyer Wideman House) and a surrounding 1.75 acre park complete with an outdoor high and low ropes challenge course, a climbing wall and more. 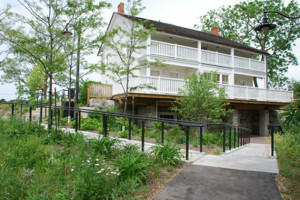 In honour and recognition of its former occupants, the Eyer and Wideman families, the historically designated house is named the Eyer Wideman House. Construction of the house dates back to 1828 and is attributed to David Eyer (1796-1871). The house today is considered one of the Town’s earliest surviving examples of a Pennsylvania-German Mennonite dwelling. The Eyer Wideman House was designated by the Town under Part IV of the Ontario Heritage Act in February 1994 for its significant cultural heritage value. Originally, the larger Eyer Homestead property (about 200 acres in all) included a sawmill operation (now demolished) and farming activities. More recently, Town residents may have known the property as “Redstone Farm”. Hey Kids, if you’re between the ages of 12 and 18 years, come check us out at the Eyer Wideman Youth Centre! This facility has been officially restored for primary use by the youth of Richmond Hill! Through the Recreation & Culture Division of the Community Services Department, we will offer you a safe place to hang out with your peers and friends, and participate in as much or as little as you like. We have a space where you can chat, play board games and Wii, do your homework, or just chill and read a book. We have a computer room where you can surf the internet or work on a school project. We also have program space where we will offer activities such as geocaching workshops, girls self-defense, creative café, sketch and draw, digital video editing, electric guitar, and so much more! To learn about youth programs, visit this page. To learn about the Rope Challenge Course, visit this page. For any additional information about the park, please visit this page or call 905 737 9210.